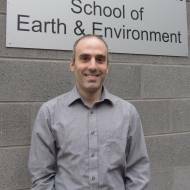 Stavros is a Visiting Research Fellow at the Sustainability Research Institute (SRI) of the School of Earth & Environment. Previously, from 2011 to 2016, Stavros was a Postdoctoral Research Fellow at SRI. His doctoral research examined the role played by the European Union in international climate change negotiations. His research interests currently focus on environmental politics and in particular, international climate change negotiations and global biofuel policies. He is also an Associate Editor for Environmental Policy and Governance. Consumption-based carbon accounting: does it have a future?